Our Fire Hazard Signs inform public about Fire Safety Regulations and Fire Routes. Keep people safe. Keep properties safe. We can create bold, vibrant, durable aluminum “No Parking — Fire Route” and “Fire Route — Vehicles Will Be Towed” signs, along with Fire Extinguisher, “In case of Fire” Signs and Fire Emergency Signs for your business. Customize these emergency signs to be reflective and maximize visibility. Our specialities. We specialize in the design and production of Custom Fire Signs, Evacuation Maps, Reflective Fire Safety Signs, Exit Signs, and large printed path markers. Fire Hazard Sign Uses. Fire Emergency and Disaster Signs allow individuals to quickly identify and interpret the location of safe zones, fire extinguishers, emergency routes, equipment, and other instructions. Personalize everything. Make emergency procedures, floor layouts, exit routes, and other vital safety information accessible in professional custom designs that match your company & By-Law requirements and color scheme for your Fire Hazard Signs. 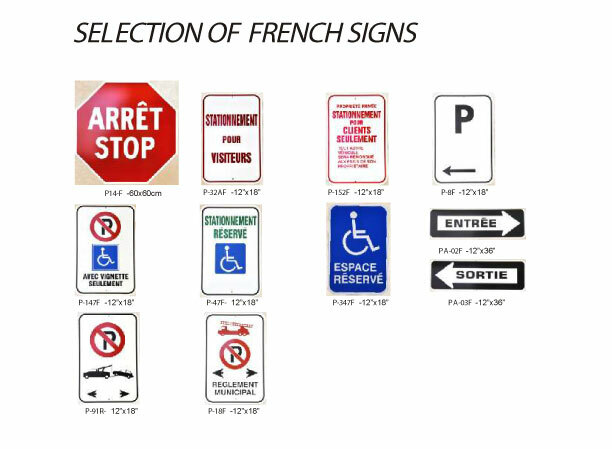 We also provide Signs in FRENCH. Never compromise the integrity of buildings, vehicles, and fire barriers! A blocked pathway or locked door invites danger. Order Fire Hazard Signs now! Need more signage? Don’t wait. Contact us for custom aluminum & reflective Reserved Signs, Restricted Area Signs, Warning Signs, Safety Signs and Security Signs, all of which can be customized affordably.